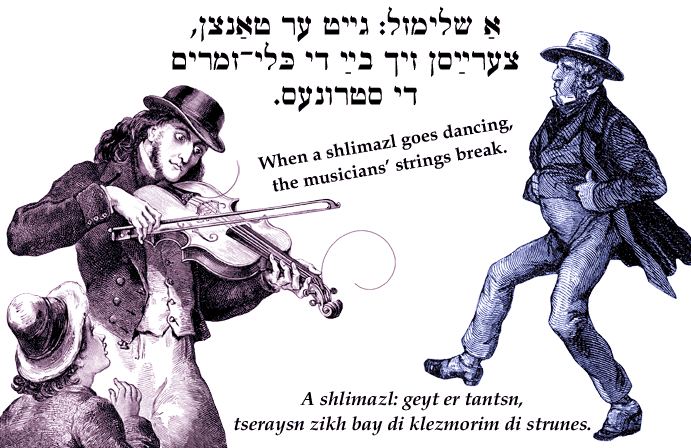 Yiddish Wit: When a shlimazl goes dancing, the musicians' strings break. אַ שלימזל: גייט ער טאַנצן, צערײַסן זיך בײַ די כּלי–זמרים די סטרונעס. A shlimazl: geyt er tantsn, tseraysn zikh bay di klezmorim di strunes. When a shlimazl goes dancing, the musicians' strings break. SOURCE: Stutchkoff, Der Oytser fun der Yidisher Shprakh. A shlimazl is a loser or a person with perpetual bad luck.